"Don John of Austria" redirects here. For the opera by Isaac Nathan, see Don John of Austria (opera). For other people named John of Austria, see John of Austria (disambiguation). Oil in canvas, 2nd half of 16th century, probably by Juan Pantoja de la Cruz. John of Austria (Spanish: Juan, German: Johann; 24 February 1547 – 1 October 1578) was an illegitimate son of Holy Roman Emperor Charles V. He became a military leader in the service of his half-brother, King Philip II of Spain, and is best known for his role as the admiral of the Holy Alliance fleet at the Battle of Lepanto. Born in the Free imperial city of Regensburg, Upper Palatinate, John of Austria was the product of a brief liaison between Charles V, Holy Roman Emperor (a widower since 1539) and Barbara Blomberg, a burgher's daughter and singer. In the summer of 1554, the boy was taken to the castle of Luis de Quijada in Villagarcía de Campos, Valladolid. His wife, Magdalena de Ulloa, took charge of his education, assisted by the Latin teacher Guillén Prieto, the chaplain García de Morales and the squire Juan Galarza. Charles V's only surviving legitimate son and heir, now King Philip II after his father's abdication, was then outside of Spain. Rumors had spread about the paternity of the child, which de Quijada had denied, and he wrote to the Emperor asking for instructions. Charles V replied with a note written by his personal secretary Eraso, in whose erasures and amendments were expressed the Emperor's thoughts about how best to deal with such a delicate matter. It was recommended to wait for Philip II's return to Spain. Joanna, Dowager Princess of Portugal and Regent of the Kingdom during the absence of her brother Philip II, asked to see the child, which she did in Valladolid in May 1559, coinciding with an Auto-da-fé then taking place. Philip II returned from Brussels in 1559, aware of his father's will. Once he had settled in Valladolid, he had summoned de Quijada to bring along Jeromín to a hunt. The first meeting between the two of them took place on 28 September in the Monastery of Santa María de La Santa Espina. When the King appeared, Luis de Quijada told Jeromín to dismount and make proper obeisance to his master. When Jeromín did so, Philip II asked him if he knew the identity of his father. When the boy did not know, the King embraced him and explained that they had the same father and thus were brothers. 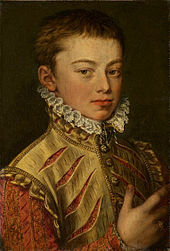 Philip II, however, was strict regarding protocol: although Jeromín was a member of the House of Habsburg, he was not to be addressed as "Your Highness", the form reserved for royals and sovereign princes. In formal style he was "Your Excellency", the address used for a Spanish grandee, and known as Don Juan de Austria. John did not live in a royal palace, but rather maintained a separate household with Luis de Quijada as the head. King Philip II had allowed John the incomes allocated to him by Charles V, so that he might maintain the status proper to a son of an emperor and brother to the king. In public ceremonies, John stood, walked or rode behind the royal family, but ahead of the grandees. John de Austria completed his education at the University of Alcalá de Henares (now the Complutense University), where he attended with his two young nephews, who were about his same age: Prince Carlos (son and heir of Philip II) and Alessandro Farnese, Prince of Parma (son of Charles V's other acknowledged illegitimate child, Margaret of Austria, Duchess of Parma). They all had Honorato Hugo (disciple of Juan Luis Vives) as a teacher. In 1562, the "House of Don John of Austria" appears in the budget of the Royal House, assigning to him 15,000 ducats, the same amount allocated to his half-sister Joanna, Dowager Princess of Portugal, with whom John had a close relationship. At the University of Alcalá de Henares, John began his preparation for his future ecclesiastical career. It was there in 1562, that Prince Carlos had suffered a fractured skull which had a deleterious effect on his personality. In 1565, Alessandro Farnese left Alcalá de Henares to reside in Brussels, where his mother Margaret of Parma was Governor of the Spanish Netherlands. Alessandro had married Maria of Portugal while in Brussels. It was said that John had learned from Alessandro how to be a philanderer. In time, John would acknowledge two illegitimate daughters, one in Spain, the other in Naples. In addition, John of Austria actively participated in court ceremonies: at the baptisms of his nieces, Philip II's daughters, Isabella Clara Eugenia and Catherine Michelle. John would be the one assigned to carry the infantas to the baptismal font. 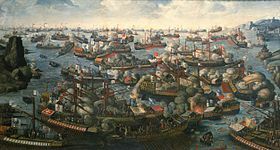 In 1565, the Ottoman Empire had attacked the island of Malta. To defend itself, a fleet was gathered at the port of Barcelona. John had asked Philip II for permission to join the navy, but he was denied. In spite of this, John had left the court and travelled to Barcelona, but was not able to reach the fleet in time. Only a letter from his brother King Philip II made John give up his efforts to continue to rendezvous with the fleet of García Álvarez de Toledo y Osorio, 4th Marquis of Villafranca del Bierzo, then located in Italy. 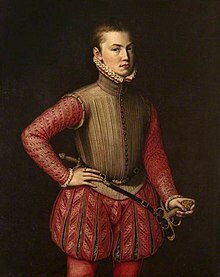 Prince Carlos, probably because of his uncle's position, and also due to the friendship they had for years, confided to John of Austria his plans to flee Spain and to travel towards the Spanish Netherlands from Italy. Prince Carlos needed John's help to acquire a galley that would ferry him to Italy. In exchange for his assistance, the Prince had promised John the Kingdom of Naples. John told the Prince that he would give him an answer, and went immediately afterwards to the El Escorial to report it to the King. John returned to the Mediterranean to take charge of the fleet. After meeting with his advisers in Cartagena on 2 June 1568, he went out to sea to fight the corsairs. This he did for a period of three months as he sailed across to North Africa, along the coast, and landed at Oran, and Melilla. A decree dated 1 January 1567 forced the moriscos who lived in the Kingdom of Granada, particularly in the Alpujarras area, to abandon their customs, language, dresses, and religious practices altogether. The application of the rule caused that, as early as April 1568, an open revolt was planned. At the end of that year, almost two hundred towns began the revolt. The king deposed Iñigo López de Mendoza, 3rd Marquis of Mondejar and appointed John of Austria Captain General, that is, supreme commander of the royal forces. Philip II placed John in the care of trustworthy advisors, including Luis de Requesens. On 13 April 1569 John arrived in Granada, where he built his forces with care, learning about logistics and drill. Luis de Requesens and Álvaro de Bazán patrolled the coast with their galleys, limiting aid and reinforcements from Barbary. The deportation policy aggravated the situation. To achieve greater effectiveness, John asked his half-brother for permission to go on the offensive. The King granted his request and John left Granada at the head of a large and well-supplied army. After clearing rebels from near by Granada, he then marched east through Guadix, where veteran troops from Italy joined him, bringing his total troop strength to 12,000. At the end of the year 1569 he had managed to pacify Güéjar, and in late January 1570 put under siege the stronghold of Galera. The siege at Galera had stalled, as it was a difficult fortress to take. John ordered a general assault, making use of artillery and strategically set mines. On 10 February 1570, he entered the village, and had it levelled to the ground with salt ploughed into its soil. Between 400 and 4500 inhabitants were killed, and 2000 to 4500 survivors were sold into slavery. He then marched on the fortress of Serón, where he was shot in the head, and his foster father Luis de Quijada was wounded, dying a week later, on 25 February, in Caniles. Soon after John took the town of Terque, which dominated the entire middle valley of the Almería river. In May 1570, John had negotiated a peace with El Habaquí. In the summer and fall of 1570 the last campaigns were carried out to subdue the rebels. In February 1571, Philip II signed the decree of expulsion of all the moriscos from the Kingdom of Granada. John's letters described the forced exile of entire families, women and children, as the greatest "human misery" that can be portrayed. The Victors of Lepanto (from left: Don Juan de Austria, Marcantonio Colonna, Sebastiano Venier). The War of Cyprus became the focus of Spain’s attention after Pope Pius V sent an envoy to urge Philip to join with him and Venice in a Holy League against the Turks. Philip II agreed and negotiations opened in Rome. Among Philip's terms was the appointment of John as commander-in-chief of the Holy League armada. While he agreed that Cyprus should be relieved, he was also concerned to recover control of Tunis, where Turks had overthrown the regime of Philip's client Muslim ruler. Tunis posed an immediate threat to Sicily, one of Philip II's kingdoms. Philip II also had in mind the eventual conquest of Algiers, whose corsairs posed a constant nuisance to Spain. Charles V had tried, and failed, to take it in the course of the Algiers expedition (1541). The Turkish remaining under Uluj Ali, the governor general of Algiers and their best admiral, tried to outmaneuver Doria's wing, drawing it away from the League center. When a gap appeared between Doria and the center, Uluj Ali made a quick turn about and aimed at the gap, smashing three galleys of the Knights of Malta on John's right flank. John came around smartly while the Marquis of Santa Cruz hit Uluj Ali hard with his rear guard. Uluj Ali himself and maybe half his wing escaped. The victory was near total, with the Turkish fleet destroyed and thousands of veterans lost. The League's losses were hardly negligible, with over 13,000 dead, However, in the aftermath the Holy league forces managed to liberate over ten thousand Christian slaves, a mild compensation for their losses. In the evening a storm broke and the victors had to head for port, while sporadic Greek uprisings were ruthlessly suppressed by the Turks. During and after the battle of Lepanto, John was addressed in letters and in person with "Highness" and "Prince". This was in contradiction to the initial protocol and address by Philip. There are no records to indicate if Philip gave Don John these honours. Coat of arms of John of Austria. Being the illegitimate son of Charles V, in his coat the partitions of the armories of his father were modified. It consisted of a divided shield in which the arms of Castile and Leon were placed in a cut and not quartered (repeated in four quarters), as usual. To the sinister, departures, Aragon and Aragon-Sicily. On the whole, in escusón, Austria and Duchy of Burgundy. In the coat of arms of John of Austria did not incorporate the blazons of Granada, Franche-Comté, Brabant, Flanders and Tyrol that appeared in the coat of arms of his father. On the outside, surrounding the shield, the necklace of the Order of the Golden Fleece. Engraving of John of Austria. The Joyous Entry of John of Austria into Brussels, 1 May 1577. Print from 'The Wars of Nassau' by W. Baudartius, Amsterdam 1616. When Luis de Requesens died on 5 May 1576, the Council of State urged the king to appoint a new governor immediately, recommending that it be a member of the royal family. Philip II appointed John of Austria as governor-general. He made his entry into Brussels in May 1577. Don Juan captured the city of Namur on 24 July 1577. In January 1578 he crushingly defeated the Protestants in the Battle of Gembloux. The defeat at Gembloux forced Prince William of Orange, the leader of the revolt, to leave Brussels. The victory of John also meant the end of the Union of Brussels, and hastened the disintegration of the unity of the rebel provinces. Six months later John in turn was defeated at Rijmenam. His health began to deteriorate, and he was attacked by a fever. John of Austria died on Sunday, October 1, 1578, at the age of 31. Maria Ana of Austria (November 1569, Villagarcía de Campos, Madrid – 27 November 1629, Las Huelgas, Burgos), who later became Abbess of Santa María la Real de Las Huelgas since 1611. Anne of Toledo, with whom he had no known children. Unnamed (born and died in 1574); reportedly died at childbirth, although it was rumoured that Philip II had a hand in his death. Antonio Colonna, Prince of Pietrapersia (1619 – 1623). Flavia Branciforte d'Austria (3 June 1606, Naples – 24 May 1608, Naples). Caterina Branciforte d'Austria (4 May 1609, Naples – 6 June 1613, Naples). Elisabetta Branciforte d'Austria (9 December 1611, Naples – 7 August 1615, Naples). Anna Branciforte d'Austria (6 July 1615, Naples ��� 1 September 1615, Naples). A "Don John" is a villain in William Shakespeare's 1599 play Much Ado About Nothing. He is listed in the dramatis personae as "illegitimate brother to Don Pedro", Prince of Aragon. Don John of Austria's life inspired the 1835 play Don Juan d'Autriche by Casimir Delavigne, which served in turn as a source for two operas, Don John of Austria by Isaac Nathan in 1847 and Don Giovanni d'Austria by Filippo Marchetti in 1879. Lepanto remains his great triumph. G. K. Chesterton in 1911 published a poem, Lepanto, in which he dubbed Don John "the last knight of Europe". The historical romance, Spanish Lover, by Frank H. Spearman (Charles Scribner's Sons, 1930), has Don John as its central character. In 1956, Louis de Wohl published The Last Crusader: A Novel about Don Juan of Austria, presenting Don John of Austria as one of history's most triumphant and inspiring heroes. ^ When Charles V was born in 1500, his mother wanted to him to be called John in honor of her late brother John, Prince of Asturias, but her husband Philip the Handsome, Archduke of Austria instead called him Charles to honor his own maternal grandfather, Charles the Bold, Duke of Burgundy. ^ a b c d e f g h i Stirling-Maxwell, William (1883). Don John of Austria, or Passages from the history of the sixteenth century, 1547-1578 (PDF). London: Longmans, Green, and Co.
^ La Santa Espina, un oasis en los Torozos. Nuestra Historia: El Pueblo (in Spanish) [retrieved 26 December 2016]. ^ a b c d e f g h Petrie, Charles (1967). Don John of Austria. New York: Norton. ^ Pendrill, Collin (2002). Spain 1474-1700: The Triumphs and Tribulations of Empire. 9780435327330: Heinemann. p. 77. ^ Carr, Matthew (2013). Blood and Faith: The Purging of Muslim Spain. The New Press. ISBN 9781595585240. ^ a b c Thubron, Collin (1981). The Venetians. Time-Life UK. ISBN 9780705406338. ^ Meyer, G.J. (2010). The Tudors. Random House Publishing Group. p. 489. ISBN 9780440339144. ^ María Ana de Mendoza in: geneall.net [retrieved 8 June 2016]. ^ Zenobia Sarotosia in: geneall.net [retrieved 8 June 2016]. ^ Diana Falangola in: geneall.net [retrieved 8 June 2016]. ^ Branciforte in: tribalpages.com [retrieved 8 June 2016]. ^ Antonio Colonna, prince of Pietrapersia in: geneall.net [retrieved 8 June 2016]. ^ Shakespeare, William. Much Ado About Nothing. Ed. Claire McEachern. London: Arden. 2006. ^ Goddard, Gloria (2006-07-25). The Last Knight Of Europe: The Life Of Don John Of Austria. Kessinger Publishing, LLC. ISBN 1-4286-6206-5. ^ de Wohl, Louis (1956). The Last Crusader: A Novel about Don Juan of Austria. ISBN 978-1586174149. Coloma, Luis, The Story of Don John of Austria, trans. Lady Moreton, New York: 1912. John Lane Company. Dennis, Amarie. Don Juan of Austria. Madrid, privately printed, 1966. A sensitive study of Don John, by an American long resident in Spain, it rests mainly on contemporary sources and has a lively treatment of Lepanto. Petrie, Sir Charles. Don John of Austria. New York: 1967. Stirling-Maxwell, William. Don John of Austria. 2 vols. London: 1883. Ward, A. W. (1881). "John, Don" . Encyclopædia Britannica. 13 (9th ed. ).